If you’re giving a presentation to camera, a teleprompter can really help you deliver a great performance. But it’s not as simple as putting the script on the machine and hitting go. I’ve worked with a range of presenters using a teleprompter, from CEOs of worldwide organisations to founders of start ups. In this article I’m going to give you my key teleprompter tips to getting the best performance. Which is the best Teleprompter app? We’ve had a lot of people ask which app we favour. In the video above we’re using Joe Allen’s Teleprompter Premium. However, we’re super excited by his new product Autoprompter, which boasts smart voice recognition, to keep the prompter scrolling in time with your voice. This will be a great feature! We use an iPad mini on a Datavideo Prompter TP-300. We put it in portrait orientation to keep the width of text as narrow as possible, so the eye isn’t moving too much from side to side. Want to know more about interview filming styles? The first place to start is with the script. When people write their first draft, it’s often in a very ‘written’ tone of voice. For example “we will” and “it is”. When we speak we automatically truncate these words, so putting the shortened form in the script will make it easier to read, and sound a lot more natural. Whichever trick you choose, it’ll mean you don’t have to get a ten minute take that perfect! Before start, we’ll offer you a little make up. We use Clinique’s invisible matte powder. It leaves no colour, but takes out the shine from the lights. Particular handy for those with receding hairlines. We also use Garnier surf hair, which is a light paste that will flatten stray hairs, which get caught in the light. 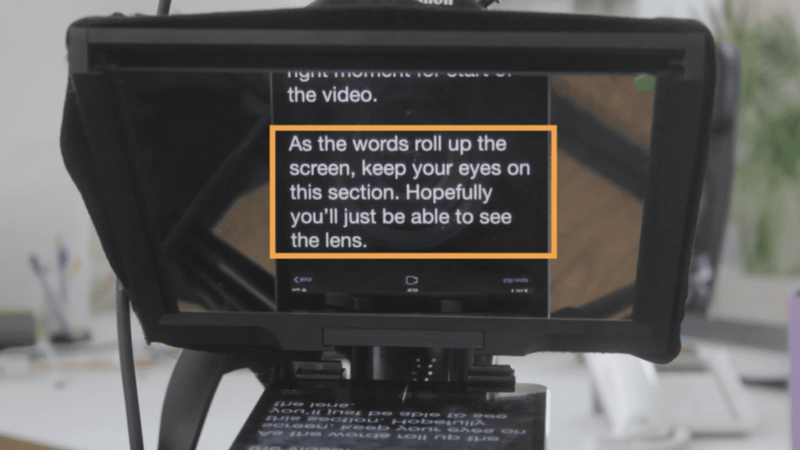 These next teleprompter tips are about actually reading from the screen. When we start filming, there will be a pause before the script starts rolling. This allows us to settle the framing and focus. At this point, just give a big smile into camera. You’ll feel silly and awkward. But it means we can cut at exactly the right moment for the start of the video. As the words roll up the screen, keep your eyes on this section of the screen. Hopefully you’ll just be able to see the lens. This’ll keep you looking directly to camera. It’ll take a few run throughs for us to set the teleprompter at the right font size and speed for you. And we’re here to be your audience – we’ll let you know if you’re speaking too fast or slow. When presenters first use a teleprompter, their voice performance can be good, but because they’re not looking at a human being, they forget to use facial expressions. This means even though they’re getting it right in terms of the way the script sounds, the visual performance can look flat. So as awkward as it might seem, imagine the camera is a person. Use those nods, smiles and eyebrow raises that you would naturally. Don’t worry about going over the top – if your performance starts to look too much, we’ll suggest you bring it down again. When you’ve finished a take, it’s natural to look up at the camera team to see how you did. Instead gentle smile and keep looking to camera. We won’t say cut for 10 seconds, again to give us a handle for editing. So those are my telepompter tips. 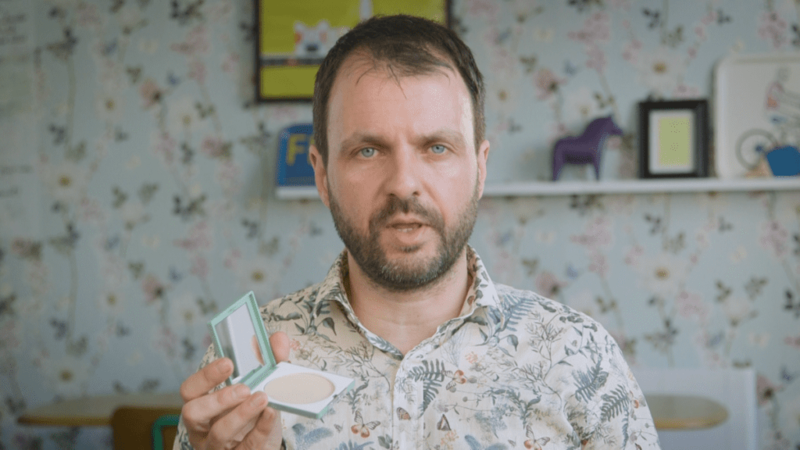 If you’re looking to give a presentation to camera then give us a call at Napoleon Creative and let us help you make it effortless and slick.